When I was put with the challenge this month to use caramel and apples in a recipe, I knew I had to take that challenge. What's more festive in October than caramel and apples?! I've had this idea bouncing 'round my head for awhile to make cake pops that look like candy apples. This seemed to be the perfect opportunity to do just that. I will confess now that it didn't go as smoothly as I'd envisioned. But, we'll get to that. The most fitting title for this blog entry is probably "A Tale of Two Cake Pops". In one corner we have the green (as in apple) coated pops and in the other corner, our pops are sans coat. At the end of this, you'll get to decide if you like your Caramel Apple Cake Pops to be coated or naked. I started this project the way 90% of my desserts start. With a box (Lord help me if I'm required to measure some dry ingredients). Want those cake pops coated? I started out by sticking half a can of apple pie filling into a food processor. I could have chopped them with a knife on a cutting board and gotten similar results. The point is that you want your apples to be bite size, since they'll be in your cake pop. I mixed my apples with my softened cream cheese and set that aside. I baked the spice cake exactly as the box instructed me to. And, it came out beautifully, just like the box said it would. But, we're not going for beautiful here, so I crumbled that baby up with a wooden fork. 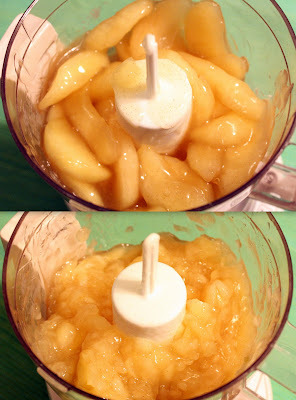 Then I took my cake crumbs and dump them right on into the apple cream cheese mixture and gave that a good mix. Now, this next step is kind of messy. Just embrace the mess or stop now. I rolled the mixture into 32 large balls. My balls were around 1 and 1/2 tablespoons of mixture each. A more appropriate amount would have probably been 1 tablespoon of mixture, but I didn't really want to coat 4 dozen balls. I'm lazy like that. Now, this is where my instructional photographs end. Because after this step I began with the wrenching of hair and gnashing of teeth (dramatic much?) and stopped with the picture taking. I'll walk you through my process. I wanted these babies to be apple green. So, I melted an entire package of almond bark in my double boiler and added yellow and green food coloring (roughly 3 yellow drops to every 1 green) until I was happy (or satisfied) with the color. I began the process of dipping the balls into the melted almond bark. I got about ten done, but my almond bark wasn't really cooperating with me. It seemed a lot gloopier than I wanted it to be. So, I thought..hmm..a few teaspoons of water might solve this problem. Do you know what happens with you put a few tablespoons of water into melted almond bark? Thus ended my dreams of having 32 beautiful, green, Caramel Apple Cake Pops. Instead I had 10 green balls and 22 naked ones. So, I decided to skip straight to the caramel and nuts portion of this idea. And, you know what? The results weren't devastating. In fact, I might just prefer my Caramel Apple Cake Pops to be presented without that green coat. To make the caramel topping, I unwrapped 25 caramel squares and melted them in my double boiler with 1 tablespoon of water. Which is what the package of caramels told me to do. Reading instructions is awesome (note to self). For the green pops, the lollipop stick needs to be inserted immediately after coating with almond bark, as almond bark hardens fairly quickly. After they were all dipped and sporting their sticks, I took a fork and drizzled the top with the melted caramel and then sprinkled the nuts on top. For the naked pops, I dipped the top of the pop in the caramel and then dipped it into the bowl of nuts. The naked pops were much easier to handle, as it turns out. And, I was able to place the lollipop sticks after I dipped them. I placed each finished pop in a cute, mini cupcake wrapper and added a paper flag pennant to the stick. And, ta-da! 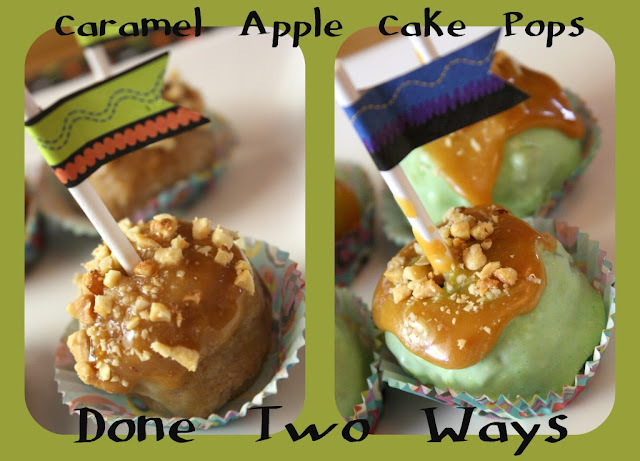 Two types of Caramel Apple Cake Pops. The verdict: The green pops are a LOT sweeter (too sweet, perhaps?) but less messy to eat. The naked pops are very yummy and very sticky. But, they are in paper cups so they're still fairly easy to eat. Either way, you can't go wrong! Stay tuned for a tutorial on my "Less Tricks, More Treats" signs! 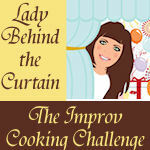 I'm part of the Improv Cooking Challenge at Lady Behind the Curtain! Please go check out some of the other AMAZING recipes below. They all are recipes using caramel and apples. Yummy! Your cake pops look amazing! 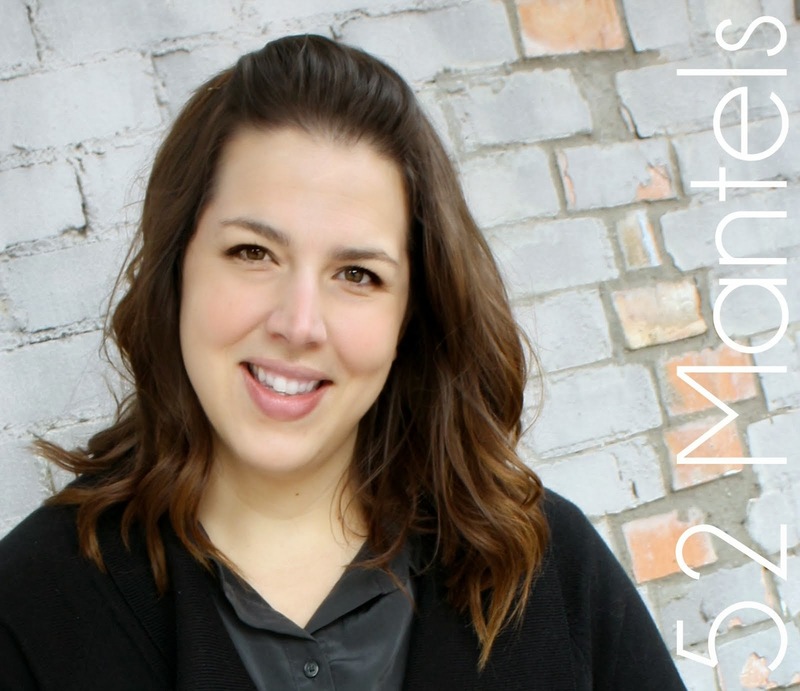 This is my first visit (fellow challenger) and I'm loving your blog! Looking forward to next month's challenge already! Super fun! I love this idea. They would be perfect for a fall party. Thanks so much for sharing these today :) I'm stopping by from the Improv Challenge. These look great! I think I like the one without the green best! I am sure either way they are absolutely delish! Cute too! This Improv Challenge is such fun. I am a follower of yours now! Oh my! those cake pops looks delicious! It was fun being part of the first ICC with you! So adorable and totally delicious looking. My daughter would have such fun making these with me. I've never made cake pops, but they sure look good! I've added the Caramel Apple Scones #53. Yum oh. Wish I was there to try one. I understand your frustration about the almond bark. Once I put it in the microwave for too long and it burned it...such a waste. I have always done it in a double boiler since then, but after I get about half of my balls coated, it starts to get globby too!! I still haven't figured it out! What a great idea! I think I like the "naked" cake pops the best. And I think I really want to try this recipe now...thanks for sharing it! Also, thanks for the info on the cooking challenge. I'm going to check out some of the other recipes too. Stopping by from Serenity Now. mmm how great do those look!! I love Caramel Apples and cake pops! this is perfect! Adorable!! I love the idea of putting the apple pie filling in with the cake! They look cute either way. Those look so good! I think I like them better without the green coating. What a fun little treat. I love cake pops and yours turned out just too adorable! What a perfect idea for this challenge! My mother is always looking for new dish of apples and she cook on every weekend. I will pass this recipe to her. What a great recipe for this month's challenge! I'll take a coated one AND a naked one, please! Sounds like it was a difficult process, but I bet so worth it. Love your presentation with the cake pop toppers, and the chalkboard background. Cute!! I love your chalkboard. I should have known you would figure out something creative to do with it. I am going to send the Girl's Gone Junkin a photo of it with your delicious little Caramel Apple Pops, since I bought it from them. Stopped over from the Follower's Fest... those all look super delish! Found you through the blog hop! 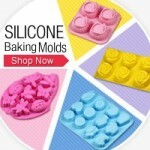 These look yum! YUM! These are the coolest little treats ever! I'm definitely pinning this to remember for later .Thank you so much for sharing! I'd like to invite you to link this recipe up for A Themed Baker's Sunday, Where the theme is Caramel! See you there! I made these but with a different flavor of cake. They turned out awesome but I put the leftovers in the refrigerator and all the caramel had melted off. Should I not store them in there? Hi! I'm sorry that happened! I made these a year ago, so I can't remember exactly. I know for sure I stored them in the freezer for a week after making them (and then took them to a party), but I don't remember if I ever refrigerated them. If I make them again, I'll experiment to see if mine melt in the fridge. That's ok. I'll try freezing them. Thank you!